Leeds Transport Conversation - Action required! So the Trolleybus is off the agenda, but what is next? Read more about Leeds Transport Conversation - Action required! On Saturday 9th July we will be joined by representatives of the Cycling Embassy of Great Britain including Mark of As Easy As Riding A Bike fame. Wheels 4 Fun is a cycling group for adults with physical disability who would like to cycle but are currently unable to or who have a bike they can ride but don’t have people they can go out riding with. It is a Community cycling club affiliated to and supported by Cycling UK, set up in June 2016 by volunteer cycling enthusiasts including two physiotherapists, who are involved with Leeds Cycling Campaign. The LCC Easy Riders Saturday group join up with Wheels 4 Fun once a month. Why not come to our monthly action meeting on Monday 4 July at 7pm to meet other regular members and discuss topical cycling issues? Leeds Cycling Starts Here Consultation - Respond Now! The Cycling Starts Here Board was setup to ensure a legacy from the Tour de France. 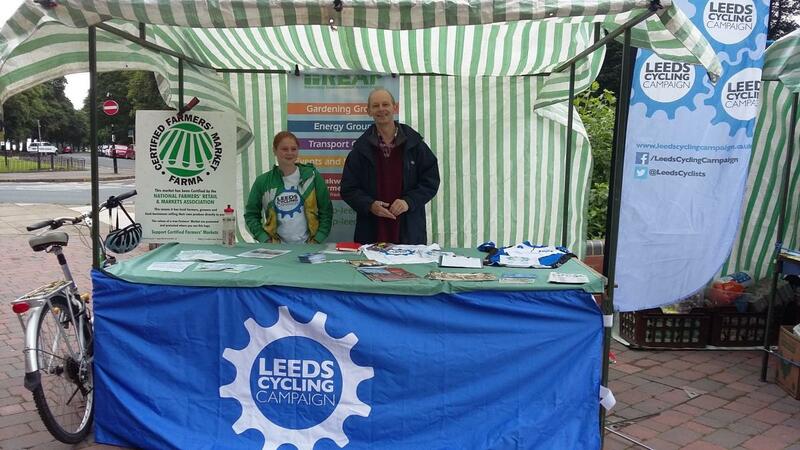 Read more about Leeds Cycling Starts Here Consultation - Respond Now! We will have a stall at Oakwood Farmers Market with information available about the campaign, and T shirts and jerseys for sale. Thanks to Tor and Peter for looking after the stand all day. We had a lot of interest in the campaign and had many people sign up for the email newsletter. If you have any suggestions for future events, please let us know. Volunteers needed to join the committee!